Sumi Madhi a volunteer on child feeding, nutrition and care interacts with mothers in Kudada, India. The United Nations Children’s Fund (UNICEF) warned today that some 77 million of the world’s newborns – or 1 in 2 – are not breastfed within the first hour of birth, depriving them of essential nutrients and antibodies and thus exposing them to an increased risk of death. According to the agency, delaying breastfeeding by two to 23 hours after birth increases the risk of dying in the first 28 days of life by 40 per cent. Delaying it by 24 hours or more increases that risk to 80 per cent. “Early breastfeeding can make the difference between life and death,” France Bégin, UNICEF Senior Nutrition Adviser, said today in a press release. “If all babies are fed nothing but breastmilk from the moment they are born until they are six months old, over 800,000 lives would be saved every year,” she added. Breastmilk is a baby’s first vaccine, the first and best protection they have against illness and disease. Putting the baby to the breast also provides them with the essential nutrients, antibodies and skin-to-skin contact with their mother that protects them from disease. A delay for this critical first contact not only decreases the newborn’s chances of survival, it limits milk supply and reduces the chances of exclusive breastfeeding. UNICEF has presented this information against the backdrop of the upcoming World Breastfeeding Week, which is celebrated annually from 1 to 7 August in over 170 countries to promote breastfeeding and improve infant nutrition. However, UNICEF’s data has shown that progress in getting more newborns breastfed within the first hour of life has been slow over the past 15 years. Particularly concerning is the situation in sub-Saharan Africa, where under-five mortality rates are the highest worldwide; early breastfeeding rates increased by just 10 percentage points since 2000 in East and Southern Africa, and remained unchanged in West and Central Africa. Even in South Asia, where the rates of early breastfeeding initiation tripled in 15 years, from 16 per cent in 2000 to 45 per cent in 2015, the increase is far from enough: 21 million newborns still wait too long before they are breastfed. UNICEF has also found that that women are not getting the help they need to start breastfeeding immediately after birth even when a doctor, nurse of midwife is assisting their delivery. For instance, In the Middle East, North Africa and South Asia, women who deliver with a skilled birth attendant are less likely to initiate breastfeeding in the first hour of life, compared to women who deliver with unskilled attendants or relatives. Additionally, feeding babies other liquids or foods is another reason early breastfeeding is delayed. In many countries, it is customary to feed a baby infant formula, cow’s milk or sugar water in the first three days of life. Almost half of all newborns are fed these liquids. “When babies are given less nutritious alternatives to breastmilk, they breastfeed less often, making it harder for mothers to start and continue breastfeeding,” said the agency. “Globally, only 43 per cent of infants under six months old are exclusively breastfed,” it added. Babies who are not breastfed at all are 14 times more likely to die than those who are fed only breastmilk. But any amount of breastmilk reduces a child’s risk of death. Babies who received no breastmilk at all are seven times more likely to die from infections than those who received at least some breastmilk in their first six months of life. 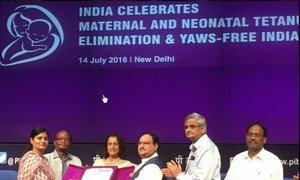 The United Nations World Health Organization (WHO) today announced the elimination of yaws, and maternal and neonatal tetanus, to India and hailed its public health achievements as examples to other countries.